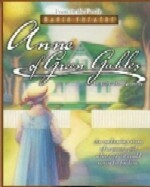 Anne of Green Gables is the story of Anne Shirley, an imaginitive orphan who comes to live with aging siblings Matthew and Marilla Cuthbert on Prince Edward Island. When the Cuthberts decide to adopt an orphan boy to help Matthew work the farm, they are astonished when red-headed Anne arrives at the train station by mistake. "What use is she to us?" grumbles the gruff Marilla. "We might be of some use to her," answers her brother Matthew. As Anne grows up, her adventures are both hilarious and moving. It's a delight to watch as she forms a friendship with the beautiful Diana and finds an admirer -- the teasing Gilbert Blythe. Anne's red-blooded attitude sometimes get the best of her, especially with busybody Rachael Lynde... yet despite being a whimsical student, Anne finds a “kindred spirit” in her teacher Miss Stacy. From her tender moments with Matthew, to being suspected of stealing jewelry, the ups and downs Anne experiences make her all the more endearing. This classic work translated into an audio drama features captivating performances by film stars Mae Whitman (Independence Day, Hope Floats) as Anne and Christina Pickles (Legends of the Fall) as Marilla. With original music and expertly crafted sound design, Radio Theatre® listeners will personally experience the world of Anne of Green Gables in a whole new way! NO LONGER AVAILABLE -- Through trial, illness, poverty, disappointment, and sacrifice, four sisters place family above all else, reinforcing the qualities of honesty, contentment, and joy.